It’s all about the attitude. 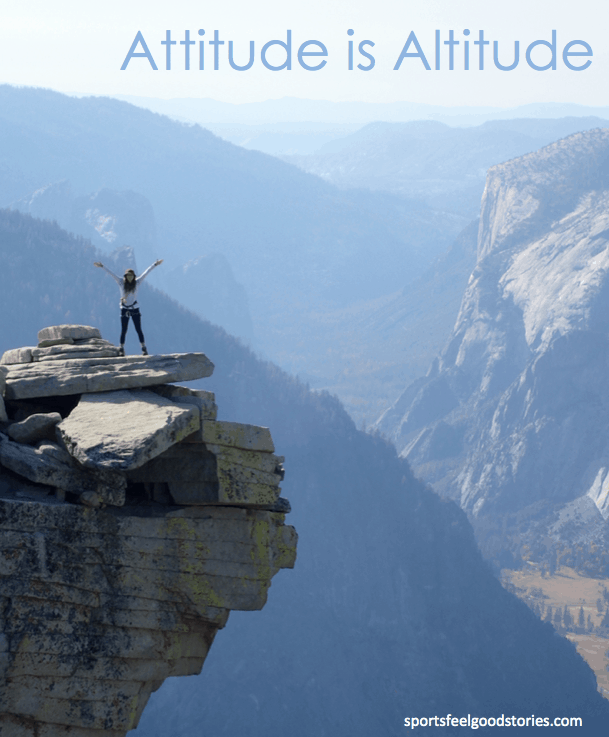 Attitude quotes can help you meet challenges and endeavors with the right attitude that can mean all the difference. If you’re trying to inspire a group of people, take a read through this collection and see if any of the quotations resonate. It is our attitude at the beginning of a difficult task which, more than anything else, will affect its successful outcome. Weakness of attitude becomes weakness of character. I am still determined to be cheerful and happy, in whatever situation I may be; for I have also learned from experience that the greater part of our happiness or misery depends upon our dispositions, and not upon our circumstances. To be a great champion you must believe you are the best. If you’re not, pretend you are. A bad attitude is like a flat tire. If you don’t change it, you’ll never go anywhere. Life is 10% of what happens to you and 90% of how you react to it. Whether you think you can or think you can’t, you’re right. Your attitude is like a price tag, it shows how valuable you are. Attitudes are contagious. Make yours worth catching. Attitude is the difference between an ordeal and an adventure. Finish each day and be done with it. You have done what you could. Some blunders and absurdities no doubt crept in; forget them as soon as you can. Tomorrow is a new day; begin it well and serenely and with too high a spirit to be cumbered with your old nonsense. It’s not what happens to you that determines how far you will go in life ;it is how you handle what happens to you. Zig Ziglar – Learn more about Zig Ziglar at his site. If you can’t change your fate, change your attitude. The optimist sees opportunity in every danger; the pessimist sees danger in every opportunity. Our attitudes control our lives. Attitudes are a secret power working twenty-four hours a day, for good or bad. It is of paramount importance that we know how to harness and control this great force. Positive thinking won’t let you do anything but it will let you do everything better than negative thinking will. Your mind is a garden. Your thoughts are your seeds. You can grow flowers or you can grow weeds. Minds are like parachutes – they only function when open. A great attitude does much more than turn on the lights in our worlds; it seems to magically connect us to all sorts of serendipitous opportunities that were somehow absent before the change. The greatest discovery of my generation is that human beings can alter their lives by altering their attitudes of mind. You can’t climb uphill by thinking downhill thoughts. I am convinced that attitude is the key to success or failure in almost any of life’s endeavors. Your attitude – your perspective, your outlook, how you feel about yourself, how you feel about other people-determines you priorities, your actions, your values. Your attitude determines how you interact with other people and how you interact with yourself. Great efforts springs naturally from great attitude. Make a game of finding something positive in every situation. Ninety-five percent of your emotions are determined by how you interpret events to yourself. I won’t accept anything less than the best a player’s capable of doing…and he has the right to expect the best that I can do for him and the team! A healthy attitude is contagious but don’t wait to catch it from others. Be a carrier. Although fate presents the circumstances, how you react depends on your character. Persistence gives confidence and continued right mental attitude followed by consistent action will bring success. When you have that knowing inside of you, fear has vanished and the obstruction to a life of all good removed. Sometimes we are limited more by attitude than by opportunities. Take charge of your attitude. Don’t let someone else choose it for you. The control center of your life is your attitude. If things are not going well with you, begin your effort at correcting the situation by carefully examining the service you are rendering, and especially the spirit in which you are rendering it. Attitude is an important part of the foundation upon which we build a productive life. A good attitude produces good results, a fair attitude poor results, a poor attitude poor results. We each shape our own life, and the shape of it is determined largely by our attitude. The only disability in life is a bad attitude. There are no menial jobs, only menial attitudes. Patience is not the ability to wait but the ability to keep a good attitude while waiting. Optimism is the one quality more associated with success and happiness than any other. Whenever you’re in conflict with someone, there is one factor that can make the difference between damaging your relationship and deepening it. That factor is attitude. I never expect to lose. Even when I’m the underdog, I still prepare a victory speech. Toughness is in the soul and spirit, not in muscles. If you could change anything about the way you approach selling, the thing that will make the biggest difference would be your attitude ? your attitude toward your customers, your service, the benefits of your products, your employer, and your self. There are two big forces at work, external and internal. We have very little control over external forces such as tornadoes, earthquakes, floods, disasters, illness and pain. What really matters is the internal force. How do I respond to those disasters? Over that I have complete control. I don’t need your attitude, I have one of my own. I believe life is to be lived, not worked, enjoyed, not agonized, loved, not hated. Happiness is not by chance, but by choice. A positive attitude will get you anywhere. If you don’t control your attitude, then it will control you. Our favorite attitude should be gratitude. A man without a smiling face must not open a shop. It’s all in the attitude. Two men look out the same prison bars; one sees mud and the other stars. Everyone has his burden. What counts is how you carry it. The state of your life is nothing more than a reflection of your state of mind. Attitudes are contagious. Are yours worth catching? I can alter my life by altering the attitude of my mind. You cannot tailor make the situations in life, but you can tailor make the attitudes to fit those situations before they arise. To different minds, the same world is a hell, and a heaven. Always look at what you have left. Never look at what you have lost. If you believe you can, you probably can. If you believe you won’t, you most assuredly won’t. Belief is the ignition switch that gets you off the launching pad.